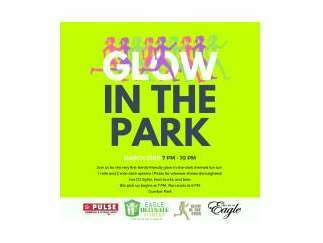 You are invited to the City of Eagle's very first glow-in-the-dark themed fun run! This run features a live DJ, glowsticks, beer, and prizes! Bring the whole family down for the "who shines the brightest" contest* for a chance to win a new pair of shoes, a gym membership, and so much more! 1-mile and 2-mile run options - Same-day registration at 7:00 PM - Race heats will begin at 8:00 PM Kanak Attack food truck and Crescent Beer and Wine will be on site filling all your food and drink needs! Thank you to our sponsors Eagle Ultimate Fitness and The Pulse Running and Fitness Shop. *Contest categories include youth, adult, and group!